On the Quai, the Piazza or the Rooftop, the clubs, bars and restaurants Garage, Nuits Fauves, Wanderlust, Communion and Café Oz Rooftop make the Parisian nights by their sophisticated programming and their unique atmosphere. In the courtyards, above the Seine, the restaurant DAD proposes gourmet hot-dogs and gourmands with a supplement of know-how “à la française”. City in the city of 15 000 m2, the City shelters singular and inspiring places. Clubbers, students, families, sportsmen, professionals, lovers of art and creation; the City welcomes nearly one and a half million visitors each year. Professional events and general public punctuate the life of the City. The venue regularly hosts companies, cultural actors, fashion and design names for exhibitions, shows, parades, showrooms, seminars, conventions, awards, conferences, launches or evenings. These events nourish the mix of the place. On the same day, a stylist on the way to the next parade and participants in a seminar on the smart city or the latest computer innovations can be seen. The Cité de la Mode and Design team creates and produces creative programming: innovation, culture and style. The exhibitions, installations and performances focus on discovering talents: artists, designers, stylists, photographers, architects, designers, graphic artists, landscapers. 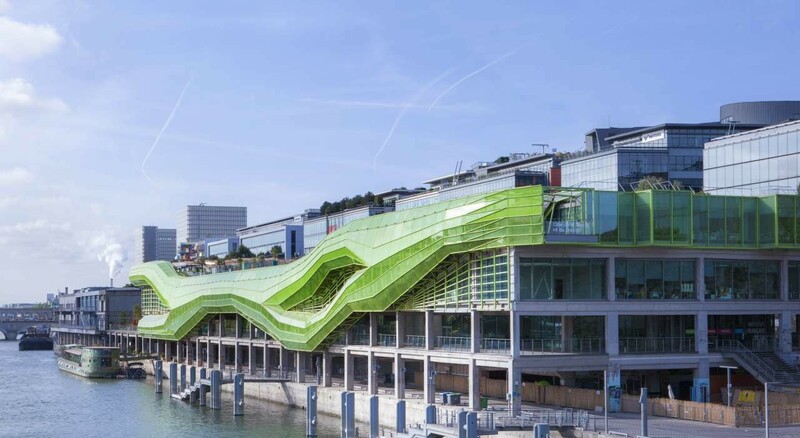 Bridgehead of the new 13th arrondissement / ZAC Paris Rive Gauche, the Cité de la Mode and Design is the emblem of a Paris in perpetual, eclectic and creative movement. The venue is distinguished by its unique mix of professional and public events, culture, recreation, education and relaxation.